Francis Cris Manning was born in Brington, Northamptonshire in 1883 and baptised there on the 6th May. His parents were George and Selina (nee Tarrey) who had married at Selina’s home parish church of nearby Harlestone on 11th November 1875. George was a labourer in Great Brington – agricultural in 1881, general in 1891 when Francis was aged eight. He then had two brothers Edward aged twelve and Lewis four. George Manning died later that year at the age of 41 and Selina two years later in 1893 at 48. We have been unable to find Francis Criss in 1901 but information from a family tree on Ancestry shows that he enlisted in the Northamptonshire Regiment in 1899 and served in South Africa. He left in 1908, signing up with the reserves. This is confirmed by his army number of 5992 which was issued in 1899. It also explains the early date of his death in December 1914. Only regular troops and reserves would be fighting at this point. By 1911 he was lodging with the Cross family at 38 Lower Harlestone. He was working as a wood man on estate and entered under the full name of Francis Christopher Manning. At the time the war started, he was working for the L & N-W Railway in the Rugby Carriage works. this seems to be his only connection with Rugby. The first few months of the Northants Reg. War Diaries were lost on 17th November during the First Battle of Ypres. The Diary starts again on the 21st December. Nov 26th 1914 to Dec 20th 1914: The Battalion was resting at Hazebrouck. Dec 21st 1914: The Battalion left Hazebrouck at 7 AM in motors. Arrived at Zellobes close to Vielle Chapelle at 12 Noon. After refilling with rations & Ammunition, the Battalion was ordered to move to Le Touret. Arrived here sometime about 4 PM. Orders were received that the Battalion in Conjunction with 1st Loyal North Lancashire Regt. Was to make a night attack to recover trenches about ½ mile East of Rue de L’Epinelte & ½ mile South of Rue de Bois. Which had been lost the previous night. The Two Battalions moved to the attack about 7 PM. The Battalion had Two Companies in the front line & Two in support. 1st Northamptonshire R. was on the North 1st L. N. L. on South by 10 PM. The position in front of us had been retaken with slight loss. Most of our Casualties Coming from Artillery fire. Total Casualties killed & wounded. Three Officers – about 60 men. According to previous orders when the position had been retaken the Battalion was to withdraw & the line to be held by the 1st L. N. L. Regt. We had however to leave One Company D in the line. The rest of the Battalion withdrew back about ½ mile to billets reaching them about 7 AM on Dec 22nd. It would have been in this “slight loss” that Criss Manning died. His body was not recovered or identified and he is remembered on the Le Touret Memorial. The Le Touret Memorial commemorates over 13,400 British soldiers who were killed in this sector of the Western Front from the beginning of October 1914 to the eve of the Battle of Loos in late September 1915 and who have no known grave. The Memorial takes the form of a loggia surrounding an open rectangular court. The names of those commemorated are listed on panels set into the walls of the court and the gallery, arranged by regiment, rank and alphabetically by surname within the rank. The memorial was designed by John Reginald Truelove, who had served as an officer with the London Regiment during the war, and unveiled by the British ambassador to France, Lord Tyrrell, on 22 March 1930. Almost all of the men commemorated on the Memorial served with regular or territorial regiments from across the United Kingdom and were killed in actions that took place along a section of the front line that stretched from Estaires in the north to Grenay in the south. This part of the Western Front was the scene of some of the heaviest fighting of the first year of the war. The only mention of his death in the Rugby press was as one of the railway men who had died. CASUALTIES AMONG L & N-W RAILWAYMEN.—According to the April number of the “ L & N-W Railway Gazette,” there were 1,058 casualties reported among L & N-W Railway men with the Forces between February 19th and March 15th. The list includes the following :—Killed: H R Barwick, East Anglian Engineers (Wolverton). Died from wounds: T C Tooth, Bucks Territorials (Wolverton); C Manning, Northamptonshire Regiment (Rugby). 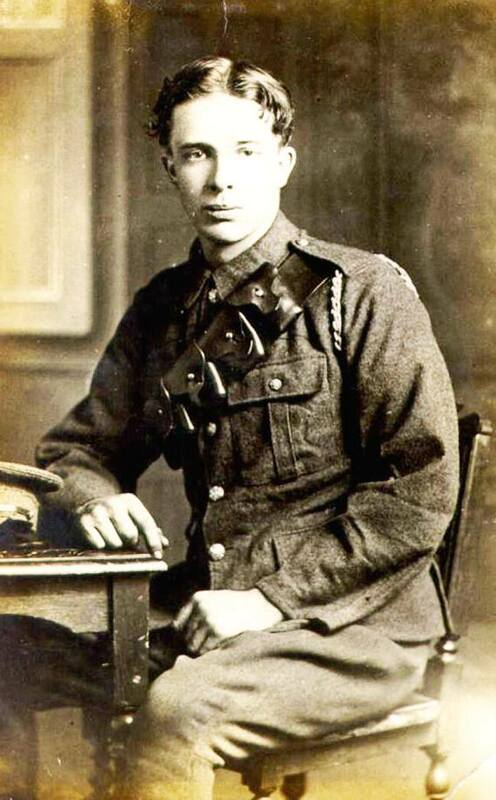 On the L & N-W Roll of Honour, Criss is remembered as C. Manning, Carriage cleaner, Rugby. He is listed on the Great Brington War Memorial (as Francis C Manning) and the Harlestone War Memorial (as Christopher Manning) On the Rugby Memorial Gates he is C Manning. He was awarded, under the name of Cross Manning, the British and Victory medals as well as the 1914 star. Alfred Eyden and Sarah Eleanor Mewis, the parents of Clarence were married on New Year’s Eve 1889. The Reverend John Murray Rector of St Andrews parish church Rugby, conducted the ceremony, and unusually eight witnesses appear to have witnessed and signed the Register. Clarence was born on the 4th November 1890. He was baptized at St Andrews parish church Rugby on the 31st December 1890. December was an unusually warm month that year, with the average temperature being four and a half degrees Celsius or forty degrees Fahrenheit. If the day was indeed fairly mild the whole family must have been in good spirits as they walked to church from their home in Clifton Road. Having qualified for the Lawrence Sheriff Grammar School for boys Clarence was obviously a boy of above average intelligence. The Census for 1911, on which he can be found, reveals that he was twenty years of age and lived at 165, Clifton Road, Rugby. This was most likely a house provided by the London North Western Railway. The other people also in residence were his Grandfather Richard Mewis aged sixty eight, who worked as a Railway engine driver and his wife Sarah, aged seventy, his father Alfred Eyden aged forty nine, Chief Rates Clerk LNWR Rugby, and his wife Sarah, aged forty four. Clarence was next, and worked as an apprentice for the LNWR at Leamington Spa. Maurice, the younger brother of Clarence was aged fourteen and a scholar at Lawrence Sheriff School. Edith Hughes, age eighteen, a general domestic servant, was also living in the house. Clarence commenced his apprenticeship on May 29th 1905 at Rugby his salary being £20 per annum. From Rugby he moved on to Brandon, Long Buckby and Leamington Spa. His salary in March 1911 was £50 per annum. His employment at Leamington Spa ceased at the end of March, and on April 3rd 1911 he was transferred to the General Manager’s office Euston where he was employed as the private Clerk to the LNWR General Manager. The family appears to have been musical: on 23 January 1915, at a ‘Concert for soldiers in the Church House’, arranged by the Entertainment Committee of the Conservative Club, songs were given by Mr. Clarence Eyden. On the next Sunday, 31 January 1915, his mother sang, and was the soloist at a meeting of the Rugby Brotherhood at the Cooperative Hall with the notice, ‘Soldiers heartily welcomed’. His parents would later move to Northampton, meanwhile, presumably after his concert appearance in early 1915, Clarence joined up in London, as a Sapper, No.88204 in the Royal Engineers. It was not long before he was sent to France and his Medal Card gives that date as 8 June 1915. He was later promoted to be an Acting 2nd Corporal, and it was possibly then that he was renumbered, WR/252025 [possibly standing for War Reserve], and with his ten year’s railway experience, it is perhaps not surprising that he became a member of the ‘Railway Traffic [or Transportation] Establishment RE’. The Establishment for the Railway Traffic Section, R.E. was 25 Officers and 174 Other Ranks. 3 Officers were Deputy Assistant Directors of Railway Traffic and the other 22 Railway Traffic Officers. The Other Ranks were made up of 1 CSM, 30 Clerks & 56 Checkers (1 Staff Sgt, 4 Sgts & 81 Rank and File), 74 to act as Porters, Goods Guards, Loaders and Train Conductors (1 Sgt with 73 Rank and File). The remainder of the unit comprised 13 batmen, 4 cooks and 4 men for general duties. So crucial was transportation that in the last months of the war, despite a shortage of front line soldiers, men with railway experience were being transferred from infantry units to railway operating companies. Clarence died of wounds, but it is not known when or where he was working when he was wounded. Because of his burial in St. Omer, he was possibly working in the St. Omer area, dealing with some aspect of railway organisation. From the dates, it is possible that Clarence was one of the casualties of the bombing of St. Omer, possibly when the ‘part of the railway line’ was hit and had reached hospital in St. Omer where he died that night, 18 May 1918, or possibly the following day. He was 27 year old. St. Omer is 45 kilometres south-east of Calais and the cemetery at Longuenesse is on the southern outskirts of St. Omer. St. Omer was the General Headquarters of the British Expeditionary Force from October 1914 to March 1916. The town was a considerable hospital centre with the 4th, 10th, 7th Canadian, 9th Canadian and New Zealand Stationary Hospitals, the 7th, 58th (Scottish) and 59th (Northern) General Hospitals, and the 17th, 18th and 1st and 2nd Australian Casualty Clearing Stations all stationed there at some time during the war. St. Omer suffered air raids in November 1917 and May 1918, with serious loss of life. The cemetery takes its names from the triangular cemetery of the St. Omer garrison, properly called the Souvenir Cemetery (Cimetiere du Souvenir Francais) which is located next to the War Cemetery. His Medal Card and the Medal Roll showed that he was awarded the British War Medal and the Victory Medal, and also the 1914-1915 Star. His father received his back-pay of £5-11-2d on 16 October 1918 and later his War Gratuity of £15 on 2 December 1919. Clarences’s parents appear to have left Rugby before 1918, and later in the CWGC record, Clarence is noted as the son of Mr A. Eyden, of 1 St. Pauls Terrace Northampton. EYDEN. —- To the ever precious memory of Clarence, the dearly beloved and elder son of Alfred and Eleanor Eyden, who fell in the Great War on Whit Sunday, May 18th 1918. —- And the World passeth away, but he that doeth the will of God abideth forever. Clarence’s younger brother Maurice Eyden also joined up. Reports in the Rugby Advertiser noted. October 1916 – Maurice Victor Eyden (O.R), younger son of Mr Alfred Eyden, of Northampton, formerly residing in the Clifton Road, Rugby, has been gazetted 2nd Lieutenant, 3rd Battalion, Northamptonshire Regiment (Steelbacks), after a course of training in the Inns of Court O.T.C. July 1917 – Second Lieutenant Maurice V Eyden (son of Mr Alfred Eyden), 2nd Northants Regiment, has been promoted to the rank of First-Lieutenant. July 1918 – Mr. & Mrs. Alfred Eyden, ‘Denaby’, St. Matthew’s Parade, Northampton, have been advised that their younger son, Lieut Maurice V Eyden, 2nd Northants Regiment, reported missing on May 27th, is a prisoner of war in Germany and quite well. His only brother (Royal Engineers) was killed in France on May 19, 1918’. London and North Western Railway, Salaried staff register [No 2, pages 1613-2092] – Goods Department. Rugby Advertiser, Saturday, 30 January 1915. Ivor Lee, 8 August 2003, http://1914-1918.invisionzone.com/forums/topic/4011-railway-transport-establishment/. Diary of the Matron in Chief in France and Flanders, TNA, WO95/3990, http://www.scarletfinders.co.uk/91.html. The item on his brother in the Rugby Advertiser, 6 July 1918, gave the date of Clarence’s death as 19 May 1918 – the day following the bombing of St. Omer. Rugby Remembers, https://rugbyremembers.wordpress.com/2016/10/28/28th-oct-1916-the-boy-scouts-a-record-of-useful-work/, and Rugby Advertiser, 28 October 1916. Rugby Advertiser, 14 July 1917, and Rugby Remembers, https://rugbyremembers.wordpress.com/2017/07/14/14th-jul-1917-the-rugby-baking-trade-no-more-men-can-be-spared/. Rugby Advertiser, 6 July 1918. Frederick Stanley EVERETT was born in 1897 in Daventry, the son of Charles Frederick (born 1869, Marsh Gibbon, Buckinghamshire) and his wife, Edith Annie, née Wall, Everett who were married on 18 July 1895 in Daventry, Northamptonshire. They moved to Narborough in Leicestershire in about 1899 for two or so years, before moving to Rugby at some date before 1901. In 1901, the family were living at 118 Abbey Street, Rugby, and in 1911 the family were at 42 Claremont Road Rugby, a six room house. Frederick now had six younger siblings and was working as a ‘junior railway clerk’. His father was also a ‘railway clerk’. Frederick had been employed as a Goods Clerk by the L & N-W Railway Company at Berkswell and Hampton. He joined up when he was aged 18 in January 1916, into the Army Service Corps as No.DN2/155017. When he went abroad is unknown, but it was probably after training, later in 1916. He went to Mesopotania and was part of the 971st MT [Motor Transport] Company. At some date he was promoted to Lance Corporal. In 1914, Baghdad had been the headquarters of the Turkish Army in Mesopotamia. It was the ultimate objective of the Indian Expeditionary Force ‘D’ and the goal of the force besieged and captured at Kut in 1916. On 11 March 1917, the British entered Baghdad … The British Indian Army played a significant role … but the position was not fully consolidated until the end of April. Amidst the confusion of the retreat a large part of the Ottoman army (some 15,000 soldiers) was captured. Given the continually depressing news in France and elsewhere, this was a significant and newsworthy achievement. British forces (and Russians, advancing from the north and east) closed in on the Turks throughout the autumn of 1917. Baghdad became the Expeditionary Force’s advanced base, with two stationary hospitals and three casualty clearing stations. By 18 November 1917, the distribution of the Mesopotamia Expeditionary Corps, suggested that the No.971 Mechanical Transport Company was equipped with Ford vans and was on the Tigris Front and they were in the Basra or Baghdad Garrison as Army Troops in the 18th Division which had just begun to be formed, although the bulk of the units (most of which were to come from India) had not yet arrived in Mesopotamia on that date. The supply lines had become overlong and General Maude had died of cholera on 18 November 1917. He was replaced by General William Marshall who halted operations for the winter. Frederick Everett died on 16 December 1917, aged 21. He was one of the very many who ‘Died of Sickness’ in the base hospital at Basra. He was buried in the Baghdad (North Gate) War Cemetery in Plot III. G. 11. His gravestone bears the wording, ‘Father in Thy Gracious Keeping, Leave we now our Dear One Sleeping’. Baghdad (North Gate) War Cemetery is today located in a very sensitive area in the Waziriah Area of the Al-Russafa district of Baghdad. … The North Gate Cemetery was begun in April 1917 and has been greatly enlarged since the end of the First World War by graves brought in from other burial grounds in Baghdad and northern Iraq, and from battlefields and cemeteries in Anatolia where Commonwealth prisoners of war were buried by the Turks. Frederick Stanley EVERETT was awarded the British War and Victory Medals, and is also commemorated on the Rugby Memorial Gates in Hillmorton Road, Rugby. Rugby Advertiser, 6 November 1909. Rugby Advertiser, 5 November 1910. Rugby Advertiser, 29 December 1917. Rugby Advertiser, 29 December 1917; also info. given in Birmingham Daily Post, Friday, 28 December 1917. Data from ‘Statistics of the Military Effort of the British Empire’, London: HMSO, 1920.